Aaron walked out to the park, and breathed in it's fresh park-y scent. "So, Lis, how have you been, minus the cold?" he asked, walking around a random tree he saw, mumbling and debating with himself about why cows can't talk in japanese. "Well, it doesn't really get cold here," Lissa said, laughing. "But I think I'll feel better soon." She smiled. "I love coming here. It's so beautiful." she said, looking around at the grass and the few trees. Aaron nodded, sighing quietly, "It is..." he yawned, and scratched his hair that was blowing on his face, Gaaahhh... he thought, trying to fix it but making it be blown back the instant he does. "My hair is impossible....I wish I had long hair.." he chuckled, and set his hands down, ignoring the wind on his hair, "Do you have any siblings, Lissa?" Lissa sat beside Aaron, folding her legs under her. "Yes. I have a 16 year old sister, named Kimimela, and a 14 year old sister named Isi. " she said. "I also have a 6 year old brother named Cody." She laughed. "He's a sweet little boy." Shge looked up at Aaron. She was enjoying herself, being out in the park with him. "I like your hair." she said, the wind blowing her own long blue hair back. Aaron chuckled, "My hair isn't special, just...bland.." he smiled, and rubbed Lissa's hair, "That sounds like a big family, is it noisy around your house?" he asked, curios to know more about the blue haired girl. Smiling, Lissa said, "Yeah, it can be pretty loud." Looking up at Aaron from her place beside him in the grass, she said, "That's one reason I was so glad to move to a dorm." She laughed. "I'm only sharing with one person now. Aaron nodded, "Well, that's good. Peace and quiet relaxes the mind...well....or so I've heard, I've only read that in a book..." he chuckled quietly, "Do you like to shop, Lis?" he asked, looking at his shoes, and sighing. He needed a new pair today. Lissa smiled. "I do love shopping." she said. "It's relaxing to me, and one of my favorite things to do with my friends." She pulled on one of her pigtails. "Why? did you have something in mind?" 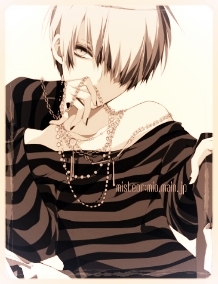 Aaron smiled, and ruffled his own hair, "I work in a clothing store....would you like to go there some day?" he asked, imagining all the clothes Lissa could wear, "I bet you'll look adorable!" he grinned at Lissa, and sighed, feeling the wind on his clothes blowing back and forth. "That's cool." Lissa said. "I bet you're great at picking clothes for people!" She smiled. "I would LOVE to go there some time." She shyly looked up at him. "You really think I would look adorable?" She asked, a slight blush covering most of her cheeks. Aaron nodded, "Probably..." he leaned in, "...between you and me, I think you'd be the princess of the school!" he whispered in her ear, smiling. "That's good, I can get discounts!" he said, sighing, and humming a song. "Ahh, nature.." he sighed, "So relaxing.." Aaron rubbed his eyes, and yawned, "I think I might need a nap.." he said, chuckling. He turned back at Lissa, and smiled, embarrassed, "Sorry, I'm like a cat sometimes.."
Lissa blushed. "Princess of the school?" she said shyly. "You're too sweet." She snuggled down next to him. "I'd like to take a nap too. I'm still not feeling perfectly well." She smiled at Aaron and laid back, close beside him.